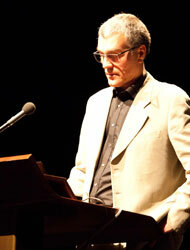 Thomas Metzinger’s hallmark is his innovative interdisciplinary approach to classical philosophical questions related to human consciousness and the self. As adjunct fellow at the Frankfurt Institute for Advanced Studies (FIAS) and co-founder of the Association for the Scientific Study of Consciousness, he established a remarkable cooperation with researchers from different areas of neuroscience. Far beyond disciplinary borders, Metzinger triggered discussions and keeps questioning established opinions and methods. Internationally, Metzinger is regarded as one of the leading researchers in the philosophy of mind. As GRC fellow, he will further advance the linkage between analytical philosophy and empirical neuroscience in a series of interdisciplinary projects. Press release "Philosophy and Predictive Processing: online open access collection of publications on the mind, brain, and consciousness"
Press release "First code of conduct for the use of virtual reality established"
Press release "Open MIND open access collection of original research publications on the mind, brain, and consciousness will soon be freely available online"
Press release "Thomas Metzinger appointed Fellow of the Gutenberg Research College"